The Wycombe Senior Cup, it’d be fair to say, is not the greatest of honours. Certainly I hadn’t come across it before, which is a shame because its fourteen entrants contain some quality names. As examples I put forward Downley Albion, Penn & Tylers Green; Bucks Student Union and, my favourite, Wycombe Judo. In terms of local competition, the Berks & Bucks Senior Trophy would be, you’d think, slightly more prestigious, yet last seasons final for the latter was held at Aylesbury Vale, while this competition reaches climax at a Football League ground. Guess which? Yet any cup tie involving local rivals is usually worth a look, and only a mile or so separates Meadow Mill from the Wasps’ ‘Nest’ ground (honestly, it really is called that), which currently houses their reserve side. Ground grading issues following last season’s promotion mean that Wasps are currently sharing Meadow Mill and thus home advantage held no real sway for this game, save for the fact they’ll be in the ‘other’ dressing room for this game, the one where the hot taps ain’t working and the treatment table’s got a short leg. 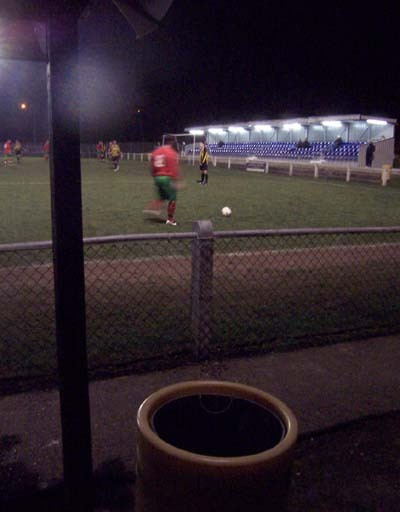 Wasps, current Wycombe Senior Cup holders, represent the neighbouring parish of Chalfont St. Giles, but despite their close proximity and the fact that both sides currently play at step 5 of the non-League pyramid, they don’t play in the same league strand. St Peter have been in the Spartan South Midlands Premier Division since the disbanding of the Isthmian League’s third tier in 2006, while Wasps climbed to the peak of the Hellenic League by winning its Division One (East) feeder last season. In this respect, Saints come out on top in terms of petrol money as the Spartan league’s stretch means their longest round trip during the season is the 106 to Biggleswade United and back. The Hellenic however, whilst clustered mostly in the gap between Oxford and Swindon, sprawls over several counties all the way over to Hereford, meaning Wasps at the eastern extremity can look forward to many a long trip, the longest to Pegasus Juniors meaning a 268 mile day out west. However what they lose in the whoever’s-in-the-van-longest-is-a-flailing-ponce contest, they make up for by comparing famous current residents; St. Giles boast 70’s and 80’s kid’s TV hero Brian Cant, whilst St Peter pretend they’ve never heard of radio sidekick Comedy Dave. Chalfont St Giles also housed John Milton whilst he completed his epic poem Paradise Lost. St Peter, on the other hand, currently houses one of them out of Girls Aloud. Another win for Giles I’d have to say, fond as I secretly am of Something Kinda Ooh! Perhaps the value in which the Wycombe Senior Cup is held is made clear by the fact that this first round game is only being played in March, over four months after it was supposed to be completed and seven after it was originally drawn out of the hat. The winners of this game would look forward to hosting Chinnor in a quarter final, although you could hardly blame either the Saints or the Stingers if they viewed this tie as not much more than an inconvenience. After all, both sides had played twenty-four hours prior to and were looking at playing Tuesday, Thursday, Saturday, at least, for the remaining six weeks of the season. The weather can be partly blamed for this backlog, but fingers will have pointed more at St Peter than St Giles, as the Saints’ progress in the FA Vase had meant disruption for both clubs. With the Vase being a national competition for clubs from Step 5 downwards, which will be lower scale semi-pro and flat amateur, the travel issues mean replays and re-arranged games take place on weekends, for however long it takes. Hence a replay, a postponement as well as three other Vase ties here had knocked the one-on, one-off do-si-do of the two Chalfont clubs for use of this grass well out of kilter. Probably just as well then, for the frayed sanity of the groundsman if nothing else, that they were drawn together for the early stages of this cup. Furthermore, each club’s migraine-ridden fixture secretary could also have been excused in taking some clandestine delight in a defeat here. However, despite St Peter trying out a few of the youth side, the two teams certainly didn’t look to phone it in and stroll through, despite the games of the previous evening. It was exactly what you’d expect a local derby cup tie to be even with the freshest of legs; loadsa goals, both defences looking to kick people and occasionally, perhaps, the ball, a befuddled looking Mr Bean of a ref, a red card and some fighting. It was hard tackling and aggressive from the get-go, legs flying around, and it was no surprise when a couple of penalties were awarded not long after each other. By the point of the first, Wasps had already taken the lead, only for Saints to equalise with a free-kick [see above] that was curled in via eyebrows then shins. 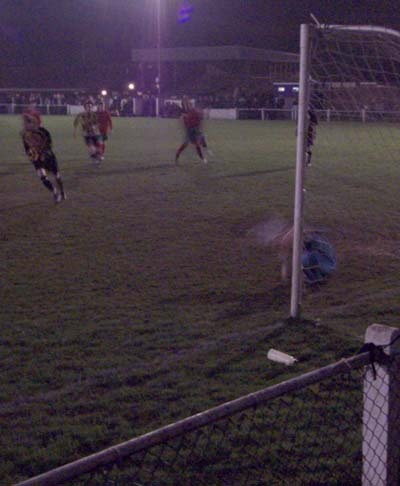 That first penalty went to the home side after twenty minutes, the keeper being sent the wrong way, a state of affairs that was reversed four minutes after when a similarly clumsy challenge was punished [see below], and which had immediately followed an even stronger, but turned down, claim. With players going down every five seconds, both halves stretched long beyond their natural lives, which was to prove critical. Saints took the lead again after an hour, not long after a Wasps player was tunnelled for a second yellow. If I’m judging the pictures in the programme correctly in the absence of a team-sheet anywhere, it would appear that the tunnelled defender was Steve Nott-Macaire, a recent Wasps acquisition after seven years with Saints. That’s the old football law of ‘returning’ players though; they’ll either be scoring the winner or running the bath. A minute later Saints had the lead, and kept it (a fourth being ruled out for offside) until the fourth of almost nine injury time minutes, when a Wasps corner dropped for a shot from the edge of the box that missed the mass of bodies and hit the back of the net. However this meant another half hour of play that neither the player’s legs, nor I, needed. The combination of the amount of added time, the half hour walk to Gerrard’s Cross station and my overestimation of the insulating properties of my cardigan meant I took my leave, missing a scoreless half hour and a penalty shoot out which the Saints won, I’m told, 4-2. 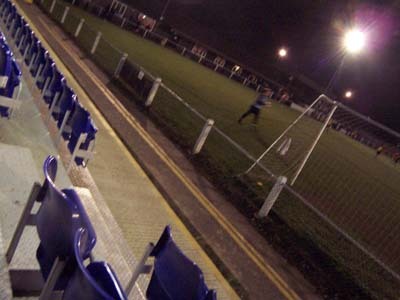 However thoughts of the two-legged Vase semi-final against Glossop North End; the four hundred fans travelling down from Derbyshire for Chalfont’s home leg to stand alongside a horde of curious locals; and, potentially, a game at Wembley in May will have meant the Wycombe Senior Cup quarter-final against Chinnor would have been one of the furthest things from their minds. Sadly it was not to be Wembley for Chalfont this year, losing 6-5 on penalties after, what sounded like, very exciting 3-3 and 2-2 draws in Chalfont and Glossop respectively. ^ - Final tie held at Burnham FC due to late unavailability of Adams Park. ^^ - Chinnor withdrew from competition. Schoolboy error :o) Never go to a game when there's a risk extra time will mean you can't get home! Sho nuff Bot, although it's not that I couldn't get home, it's just I wanted to get home earlier than 1am. I'm getting old and, that night, I was also getting rather cold. Besides you are talking to someone who, but for Kevin Scriven's last minute penalty save away at Shortwood United in this years Cup 2nd Qualifying Round (http://dubsteps.blogspot.com/2008/10/shortwood-united-0-havant-waterlooville.html) that prevented extra time, would have had to kip in Swindon bus station in order to get home from a game. Still, this is all part of the fun when you can't/won't/generally don't need to drive btu also can't resist watching your team at a new ground in the sticks. That said, i had a lovely night in Clwb Ifor Bach/Cardiff Bus Station after Wales v Germany the other week.